Samia Abdel Malik attended the University of Ontario Institute of Technology and was part of the first graduating class academic year 2003 – 2004. She graduated with her Bachelor's Degree, Faculty of Education. 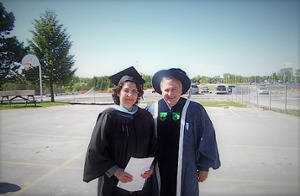 This photo was taken at her convocation, June 2004, with then university President and Vice-Chancellor, Dr. Gary Polonsky. She was a lifelong learner and dedicated educator with the Durham Catholic District School Board. Samia believed that education opens the door to future opportunity and success. Samia led by example and her children followed in her footsteps, Mariam earning her nursing degree and Bishoy an engineering degree, all graduates of our university. The Abdel Malik family have chosen to honour her memory by creating this award. The Samia Abdel Malik Memorial Award will be awarded to a mature student in the Bachelor of Science in Nursing program, Faculty of Education, Engineering or Computer Science who has financial need and is in good academic standing. To be a part of the Samia Abdel Malik Memorial Award you can make a donation online, and select Samia Abdel Malik Memorial Award.